The Noctilucales are an order of marine dinoflagellates. They differ from most others in that the mature cell is diploid and its nucleus does not show a dinokaryotic organization. They show gametic meiosis. These cells are very large, from 0.2 to 2 millimetres in diameter, and are filled with large buoyant vacuoles. Some may contain symbiotic green algae, but there are no chloroplasts. Instead, they feed on other plankton, and there is usually a special flagellum involved in ingestion. Noctilucales reproduce mainly by fission, but sexual reproduction also occurs. Each cell produces numerous gametes, which resemble more typical athecate dinoflagellates and have the dinokaryotic nuclei. 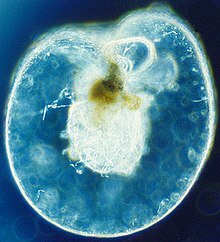 Evidence suggests that they diverged from most other dinoflagellates early on, and they are generally placed in their own class. The most common species is Noctiluca scintillans, also called N. miliaris. Blooms of this species are red-orange and can be bioluminescent when disturbed, as are various other dinoflagellates, and large blooms can sometimes be seen as flickering lights on the ocean, known as the milky seas effect. Another example is Spatulodinium pseudonoctiluca. ^ Gómez F (2012). "A checklist and classification of living dinoflagellates (Dinoflagellata, Alveolata)" (PDF). CICIMAR Océanides. 27 (1): 65–140. Archived from the original (PDF) on 2013-11-27. ^ Eckert R, Reynolds GT (May 1967). "The subcellular origin of bioluminescence in Noctiluca miliaris". Journal of General Physiology. 50 (5): 1429–58. doi:10.1085/jgp.50.5.1429. PMC 2225713. PMID 5340466. ^ Gómez F, Souissi S (March 2007). "The distribution and life cycle of the dinoflagellate Spatulodinium pseudonoctiluca (Dinophyceae, Noctilucales) in the northeastern English Channel". Comptes Rendus Biologies. 330 (3): 231–6. doi:10.1016/j.crvi.2007.02.002. PMID 17434117. Fernando Gómez; David Moreira; Purificación López-García (2010). "Molecular phylogeny of noctilucoid dinoflagellates (Noctilucales, Dinophyceae)". Protist. 161 (3): 466–478. doi:10.1016/j.protis.2009.12.005. PMID 20188628. Haddock SH, McDougall CM, Case JF (May 2011). "Red Tides: Noctiluca Red Tide". The Bioluminescence Web Page. This page was last edited on 18 February 2019, at 05:14 (UTC).